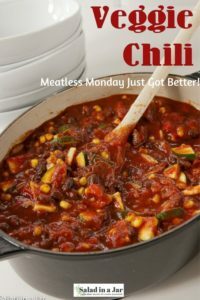 Vegetarian Chili contains mushrooms, black beans, zucchini, and corn, among other things. It’s a great way to do Meatless Monday. Do you observe Meatless Monday? Can’t say that we do. However, it’s a good idea. It’s just that a meatless meal depends more on my mood or what I have in the freezer than the day of the week it is. 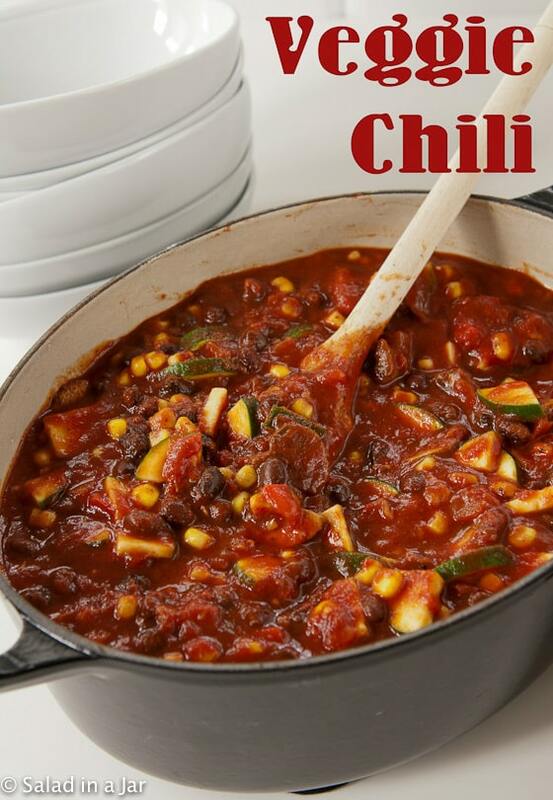 Although you might think of chili as a winter dish, this vegetable chili is a colorful and healthy way to use lots of summer vegetables when they are fresh and less expensive. These days, of course, zucchini, yellow squash, mushrooms, and corn are readily available year-round. So keep this recipe in your back pocket any time you want or need to lighten up dinner. This easy soup boasts lots of fiber and vegetables. It’s filling without a lot of calories. You can have dinner ready in almost half an hour. Since we are the “condiment family.” I’m always looking for toppings for my soup. Shredded cheddar adds color and flavor. A bit of sour cream wouldn’t hurt the taste either. Alternatively, try chopped cilantro if that’s your thing. Sprinkle a tablespoon or two over your soup before serving. Cornbread or crackers are all you need to complete your meal. 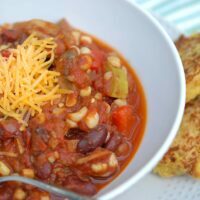 Vegetarian chili contains mushrooms, black beans, zucchini, and corn, among other things. Heat oil in large soup pot. When it starts to glisten, add onion, peppers, and garlic. Cook until softened. Add mushrooms and cook 3 more minutes. Add tomatoes, tomato sauce, chili powder and cumin. Heat to a boil. Reduce heat to low and add beans, zucchini, and corn. Simmer 15 minutes or until vegetables are tender. Garnish with Cheddar if desired. I love your info on yogurt and this chili recipe sounds awesome. I’m new to yogurt making and you have been a great help. I looked at this recipe after just sprouting my first batch of black and navy beans. I cant wait to try this recipe out with them. I think you would enjoy sprouting beans. It’s very simple, you rise and drain your beans every 8-12hrs for 2-6 days (3 is best) and they store for 2 weeks in your frig. This cuts carbs and ups protein in the beans, as well as cuts down on gastral problems. I have never tried sprouting veggies but it sounds like I should. Thanks for writing. I just stumbled across this website and am eating the veggie rollups as I type. Great website–thank you! This sounds really good! You’ve been busy on the website, it’s looking awesome! I’m still in Seattle…home on Tuesday if I can get on a flight!